It’s a little known requirement of the new health care law. 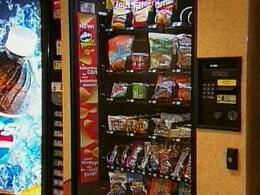 Vending machines will begin posting calorie counts. It’s all aimed at helping you make smarter food choices. But, will it work? NBC’s Joe Fryer reports. >>> it's one of the lesser known requirements under the new health care law . calorie counts are soon to be posted on vending machines nationwide. the goal is to help you make healthier choices, but will it work? our report from nbc ease joe fryer. >> reporter: a4, b6, c7. these are the letters and numbers we're used to seeing on vending machines but soon a new crop of information will appear, the calorie count. >> for me, i think it's a great idea. i would definitely use it. >> i think it's kind of silly, being that it's a vending machine and most people don't really go to a vending machine for a nutritious snack. >> reporter: as part of the health care overhaul, calorie information will soon be required on about 5 million vending machines nationwide. >> some regulations make sense. this is one of the ones that are really a flop. >> reporter: allen's company, absolute vending, as hundreds of machines. he says the cost will be hard for smaller companies to absorb. >> it equates to cutting down on jobs and other things. >> reporter: the fda estimates this change will cost the vending machine industry $25.8 million up front and $24 million a year after that. but that is how much the health care system could save the fda says if just 0.02% of obese adults ate 100 fewer calories a week. >> on the upside of this, saving just 100 calories a day can help you lose ten pounds in a year. >> reporter: inside a single vending machine , there's a wide range of options from a bag of chips that has 100 calories to a pack of cookies that totals 650 calories. some vending machines already highlight healthier options and many restaurant chains now post calorie information, although early research shows most customers don't pay attention. >> but because some people will find this useful, there's no downside to using this kind of information. >> reporter: once the fda releases the new rules early next year, vending machine companies will have a year to comply and make sure every code comes with a calorie count. joe fryer, nbc news, los angeles .